Sean Colby said he was surprised to find a cache of supplies in a fallout shelter at South Boston’s UP Academy Boston, including “Civil Defense” crackers. They were stashed there in the event of a nuclear attack. And they are still there, more than 50 years later, in a dark, concrete crawl space in the basement of a South Boston middle school: Civil Defense water canisters, crackers, and sanitation kits with toilet tissue, soap, plastic cups, and can openers. All are labeled “survival supplies, 1962,” the era of “Dr. Strangelove,” duck and cover, and mutually assured destruction, when the Kennedy administration designated the school as a nuclear fallout shelter. 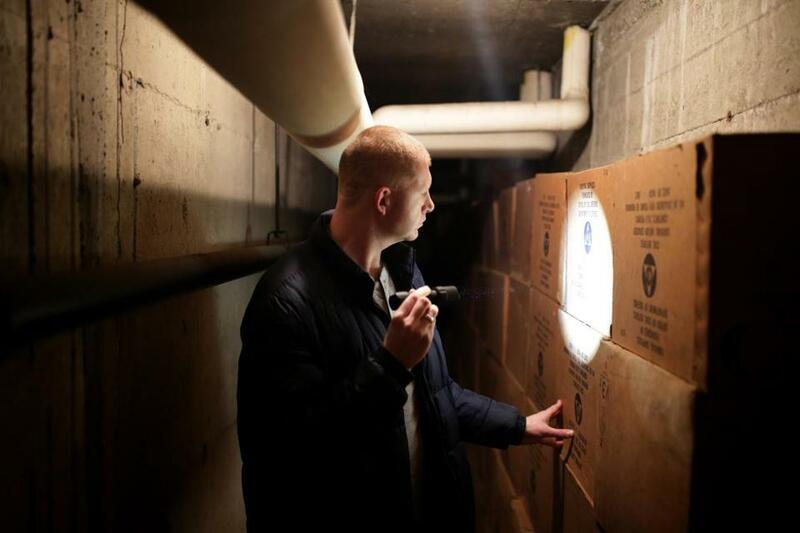 Sean Colby, a Boston firefighter, discovered the cache of Cold War supplies while photographing UP Academy Boston for his website, which documents some of the more than 1,100 fallout shelters that were part of the fearful fabric of life in Boston in the 1960s. Now, as Americans confront the possibility of nuclear war with North Korea, the idea of sheltering from a lethal downpour of radiation no longer seems like a remote concept from a filmstrip in a bygone era. Companies that manufacture private fallout shelters report that sales have doubled since August, when President Trump promised to unleash “fire and fury” on North Korea if it threatened the United States or its allies. And Colby has noticed a huge increase in traffic to his website, falloutfivezero.com. Colby said he has seen an uptick in traffic to his website, where he documents some of the fallout shelters that were in place in Boston. Above: Colby at the South Boston school that would have served as a fallout shelter. The resurgence has raised questions about how effective fallout shelters would really be in the event of a nuclear attack, and whether it would be wise for Americans to huddle underground after a nuclear blast. Experts offer some surprising answers and some serious warnings. Even as the conflict seems to escalate, Bostonians aren’t exactly tightening their gas masks just yet. Jeff Schlegelmilch, deputy director of the National Center for Disaster Preparedness at Columbia University, said that even though fallout shelters are often seen as ludicrous relics from a time when schoolchildren practiced hiding under their desks, the “concept of fallout sheltering is more appropriate now” than it was in the 1960s, when there was little chance of surviving an all-out nuclear war with the Soviet Union. 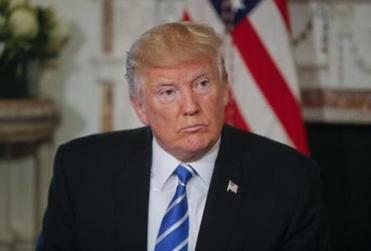 These days, Americans who are not instantly incinerated might be able to survive a nuclear missile from North Korea or a “suitcase nuke” detonated by a terrorist, he said. “If you see the flash of light and you see the mushroom cloud, the good news is you’re not dead, and you probably have 10 to 15 minutes to get somewhere,” Schlegelmilch said. He said it’s critical to find a place with “thick layers of concrete, ideally underground, and toward the center of the building”— places much like the hulking, brick schoolhouses and department stores that were once designated as fallout shelters around Boston. Subways are not recommended because they draw in too much outside air, he said. But higher floors in large buildings could work, as long as they’re not near the roof, where radiation falling from the sky could easily penetrate. “The concept of appropriate shelter is not only useful, it could save tens of thousands and even hundreds of thousands of lives by convincing people to shelter appropriately rather than evacuate when all this fallout is coming down,” Schlegelmilch said. Increasingly, Americans hoping to survive such a nightmarish scenario are turning to companies like NORAD Shelter Systems LLC, a Texas manufacturer that sells shelters ranging in price from $200,000 to $2 million. Ron Hubbard, the owner of Atlas Survival Shelters, in California, said sales have also doubled for his shelters, which start at less than $10,000. “Now, because of Kim Jong Un, the shelter has transcended both parties,” said Hubbard, who expects to handle 1,000 installations in 2018. “I have liberals buying shelters and I have conservatives buying shelters, and it wasn’t like that until six months ago,” when the typical buyer was a gun-owning conservative. 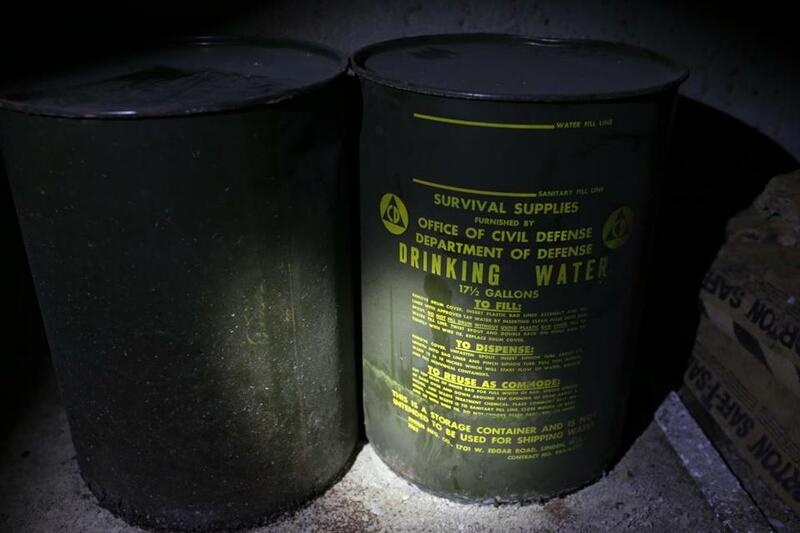 Colby also discovered barrels of water from the 1960s in the South Boston fallout shelter. Over the next several years, the Office of Civil Defense — the forerunner to the Federal Emergency Management Agency — designated tens of thousands of courthouses, schools, and other buildings nationwide as fallout shelters. In Boston, Jordan Marsh (now Macy’s), the Museum of Fine Arts, and Faneuil Hall were among the list of approved shelters, adorned with iconic yellow-and-black placards. Americans also became fascinated with home shelters, although estimates suggest fewer than 200,000 were ever built. The interest in home shelters, meanwhile, prompted fears that only the rich would be able to afford them, that only suburban families with backyards would survive, and that families who had shelters would lock out neighbors who were desperate to get inside. A Time magazine article, Rose said, described a man building a fallout shelter with a machine-gun portal in the door and promising to gun down any neighbors who would try to enter. Americans ultimately rejected fallout shelters because “they didn’t like the idea of themselves burrowing underground to save their own skins,” Rose said. The federal government effectively abandoned the program in the 1970s, when nuclear bombs became so powerful that the notion of hiding in an elementary school basement became preposterous, Schlegelmilch said. Rose said he is distraught that shelters are once again drawing interest. 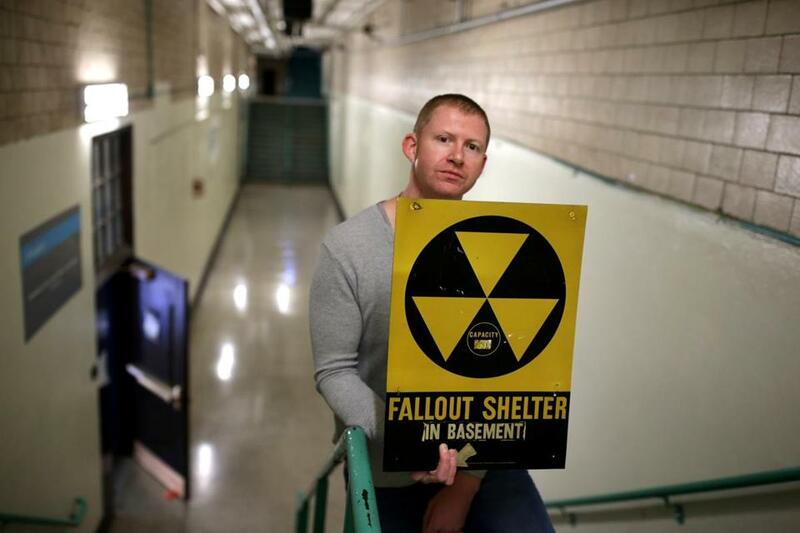 Kurt Schwartz, director of the Massachusetts Emergency Management Agency, which has its headquarters in a Cold War-era bunker in Framingham, said his department doesn’t have any program to identify, manage, or track fallout shelters for the general public. Irwin Redlener, a pediatrician who is Schlegelmilch’s boss and a nationally known disaster preparedness expert, urged Americans to educate themselves about sheltering safely. But he said sheltering is no solution to the threat of nuclear armageddon.